For this posting of One Man's God, I thought it best to go back where it all began for me. The Babylonian myths in the Deities and Demigods are one of the most interesting collections of characters in the book really. I was fascinated by them and when I got to college I jumped at the chance to take a mythology class and learn more. There Professor Joan O'Brien (yes I remember her 30 years later, she was that good) told the story of Gilgamesh and Marduk and many others in the Enûma Eliš, or When On High. So I am likely to spend a couple of posts on this topic just because it is so rich. Now I want to clear about one thing. I am not here to dismiss or deride the research done by James M. Ward and Robert J. Kuntz. They did what they did without the benefit of computers, the internet and the collected archeological knowledge I have access too since 1980. For example, there were some pretty significant finds in 1984 and published in 1992 that would have changed some things. Plus they were not writing for historical, archeological, or mythological scholarship. 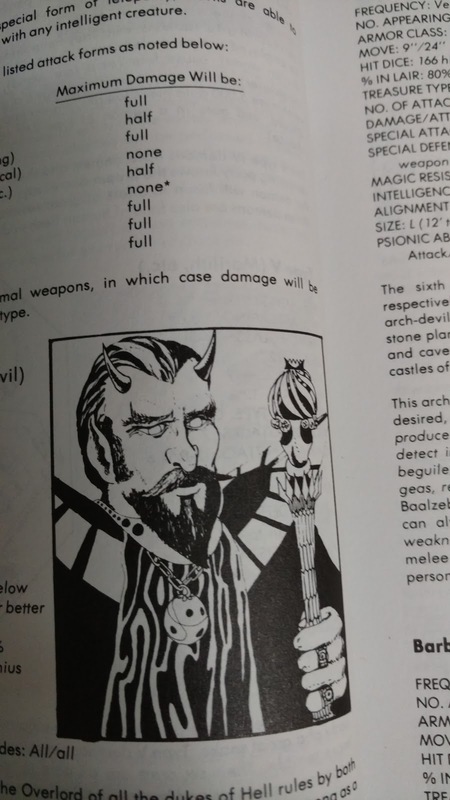 They were writing first and foremost for the AD&D game. So let's keep that all in mind when digging through the rubble of ages. The myths of the Sumerians, Akkadians, and Babylonians represent some of the oldest myths and stories mankind has intact. Dating back to 3500 BCE these are quite old. Sumer, Akkad, and Babylon (the Empire, not just the city) roughly share the same area between the Tigris–Euphrates rivers, they also shared related languages; Sumerian, but mostly Akkadian. They used the same cuneiform writing and they recorded them on clay tablets. They shared gods and they shared a culture. While there is more time (more than twice the time really) between the rise of the Sumerian city-states and the fall of the last Babylonian empire than there is between Babylon and now, we tend to view them as related. Because of this I am more likely to treat the Babylonian Mythos and the Sumerian Mythos of the D&DG as being one and not two. Let's start with what can only be called the Poster Boy for this series. Druaga, Ruler of the Devil World. We really don't know much about this guy other than he is a real monster. We know he never appears to anyone the same way twice, yet he has a true form that frightens others. He is Lawful evil and can summon devils (except Archdevils) and can turn victims of his mace attacks into devils. 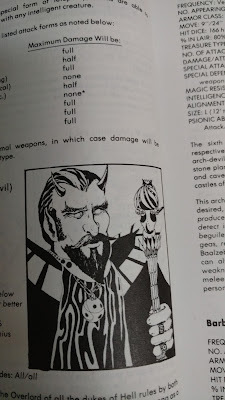 Is it me or does his mace remind you of Asmodeus' Ruby Rod? I have a lot of issues with Druaga here. If you thought he doesn't really seem to fit the Babylonian gods then you are right. He doesn't appear to be one of their gods at all. There is a connection to "Druj" which is an Avestan (proto-Iranian) spirit of corruption. But that concept comes from later and further away than Babylon. He appears to be made up whole cloth for this book. 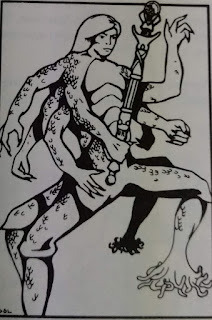 The only other reference to him in anything like this form is from a 1984 video game and later anime; Doruāga no Tō or The Tower of Druaga. The game features Gilgamesh and Ki, who seems to be based on the Sumerian Goddess Ki (yeah I have some issues with her too...). Druaga even looks similar to the D&DG version. There is also the issue that despite his obvious power there is no place for him in the devils' hierarchy. He is more powerful than Asmodeus and can create new devils besides. So what gives? In my own games, I took Druaga and I put him on the first layer of Hell in place of Tiamat (more on her in a bit). First, I figured he was a better fit since I wanted Tiamat to be Chaotic Evil and he had the look. I had already started dividing my devils into the ruling and serving classes. The rulers were the fallen angels or everyone from a pitfiend up. The servers were the less human looking devils (Eventually called "Shedim" or Demons of Rage in my games) Druaga was their leader. To steal from the greats I had made my Hell already filled with some creatures. Some the Fallen took over and others they kicked out. I also made my first level of Hell the place where the pagans go, ala Dante's Inferno. Over the years we have gotten a number of Rulers of Avernus; Tiamat, Bel and now Zariel. Maybe Druaga was there first. Looking at his stats he is pretty powerful. Strength at 24, Intelligence at 18, Dexterity at 23, Constitution at 25, and a Charisma of -4. Only his 13 Wisdom fails to be godly. He is listed as a 15th level fighter, 15th level magic-user, and 15 level assassin. If we give him 15 HD and maximum hp (d8+7 for Con) then that gives us 225 hp. Not far off from his 230. 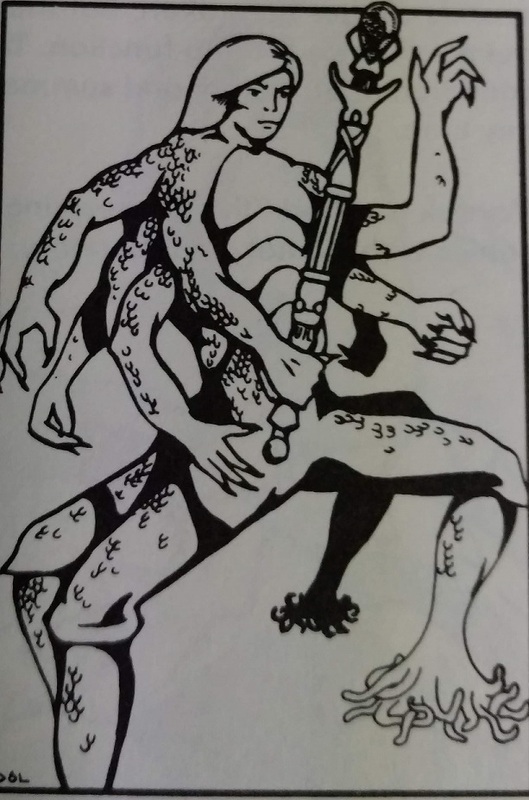 He has 75% magic resistance as well as being immune to breath-weapons. 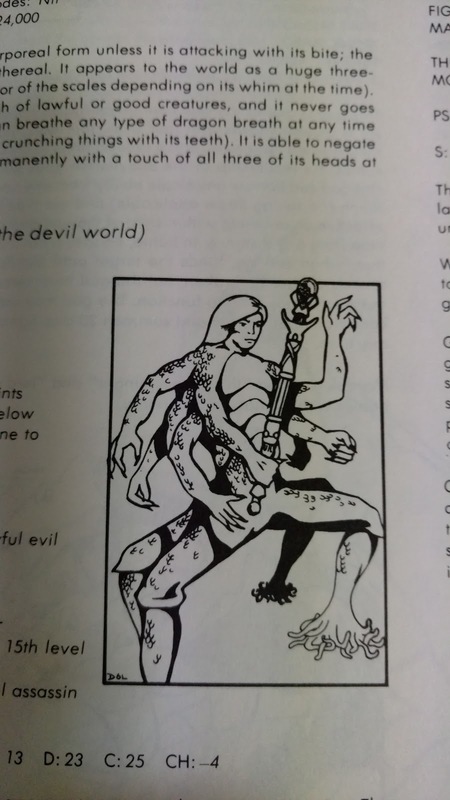 So why is he not ruling hell? If we go with the Politics of Hell article as a guide, Druaga was the ruler but was deposed when the Angels fell and became Devils. For starters, I am happy with 15 HD, though higher is also nicer. 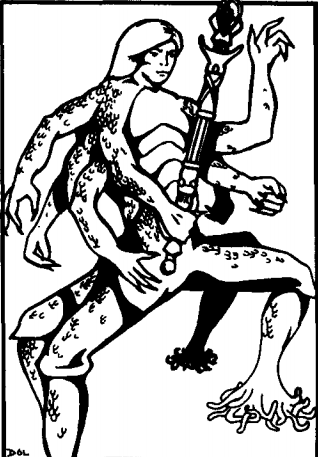 The 1e AD&D Monster Manual sets the Pit Fiend at 13 HD, so 15 HD for a former ruler, reduced in power works for me. When the Angels fell after the War in Heaven, Druaga was already there. When faced with the legions of the Fallen, Druaga surrendered his ruby mace to the leader of the Fallen. Eventually, it came into the possession of the Arch Duke Asmodeus. Druaga still holds considerable power. He lives in a giant ziggurat temple on Avernus where the souls of the damned still perform service to him. He can summon any devil of Pit Fiend status or lower to his aid once a day in numbers from 2-20. 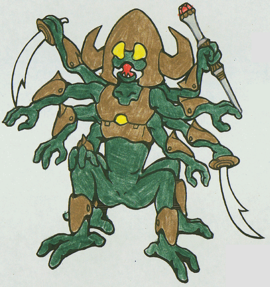 Druaga has all the same immunities as do other Devils, he is also 100% immune to the effects of all breath weapons. Next time we will talk dragons. also the God of megaverse by Carella is a nice read. 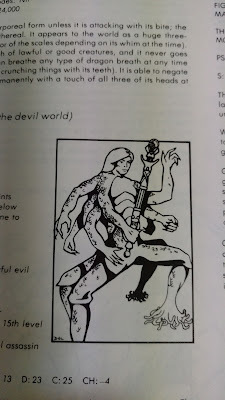 Though I loved D&DG/Legend & Lore growing up, but I never contemplated using them or any other real world pantheon in my D&D campaigns, I preferred using Fantasy Pantheons. I've considered doing so, but I'd be basing them on my study on Mesopotamian Religion because of my interest in Mesopotamian Polytheism.